The days have been getting shorter and the weather is cooler. The holiday season is upon us! What a great time of year to celebrate with family and friends. 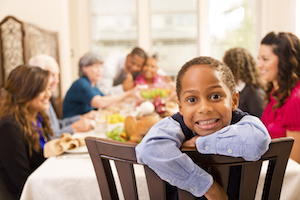 Many holiday celebrations revolve around food which can be a challenge for a dialysis patient. Over-indulging or making the wrong food choices can easily cause fluid overload and dangerously high potassium levels. Making smart food choices, planning ahead, and watching your portions will help you enjoy a safe and healthy holiday season.